I went to the ballet last weekend! It was my first one. I feel so fortunate to be able to go to things like that here. When I was growing up, we were too far from any major cities for it to be really feasible to attend concerts etc. very often. Going to Youthquake was the highlight of the year!I never took any dance classes when I was young, so I wasn't sure if I'd be able to appreciate the ballet or not, but though I'm sure I missed a lot of things, I thought it was wonderful. We saw Sleeping Beauty, perfomed by the Marinsky Ballet Company from Russia. The sets and costumes were beautiful, and the dancers were amazing. Anyone who can move their body like that earns my respect! On Friday night when we got to class, I found out that my translator (co-teacher) was not feeling well. Since there were a number of teachers and subs out that week, I'd have to teach the class on my own! Now this is a mixed-level newcomers class about the basics of the Bible. Usually I don't like having translation in class, but in this case, it's necessary, especially for those who have an extremely low level. SO.... I ended up translating for myself! And it was hard. It was a cool challenge for me in learning Chinese, but man....it felt like I taught the class twice in one hour! Fortunately, I've been teaching this class for over a year, and have heard the Chinese version weekly, so there was some stuff I could parrot, just from repetition. Other stuff, I would ask "what does ____ mean?" and some of the higher level students would say it in Chinese! It seemed to go pretty well, but I hope I don't have to do it again! Ok, before you think I'm promoting organized crime in the classroom, let me tell you about this game. 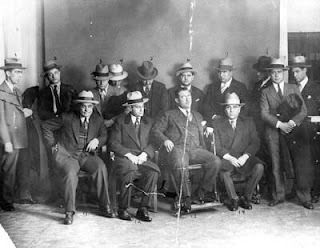 If you've gone to college in the past let's say 10 years, you may have heard of Mafia. If so, you can skip to the blue part of this post. It's kind of a strategy role playing game that I'd never actually played, but know was extremely popular in certain boys' dorms when I was at school. It uses cards to determine roles. There are a set number of killers (or mafia), a doctor, police, and a narrator (shop owner). During the "night" in the game the narrator directs the mafia to open their eyes (everyone else is "asleep") and secretly kill someone. After they go back to sleep, the doctor gets to choose someone to save. It's a matter of chance, since they don't know who will be killed. Then the police get to "investigate" one person, and the narrator will indicate whether or not they are the killer. The sixth semester of the English Bible Study began yesterday! We had around 30 students. Since we started with just 12 in 2006, it's wonderful to see the class grow each new semester. Here are some pictures of the first night activities. As you can see, there are students of every age. This semester, we'll be studying Genesis. As someone who grew up reading the Illustrated Children's Bible, it's easy to forget that many people in Taiwan don't know much at all about Adam and Eve, or Cain and Abel, or Noah, or Abraham, and the important lessons these stories teach us. I got this email from an organization today that got me thinking...and I just might try it! Even if we only do it for a few days or weeks, it's possible to make a difference! I'll copy most of the message here, with a note from me at the bottom.